If you have plans to watch the total solar eclipse that will cross the United States on Aug. 21, you likely have a long checklist of things to do. For example, you’ll want to buy special protective eyewear and plan a way to beat traffic as hordes of people travel toward the path of totality. But should that checklist include securing protective glasses for your pets? Animals will probably be fine, as they don’t tend to look directly at the sun. But it doesn’t hurt to be safe and protect cats, dogs and other animals. 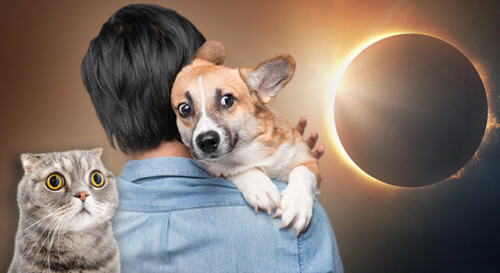 Pets may still become fearful during the eclipse. Dogs are among the most affected household animals during eclipses. During a major eclipse in 1932, the Boston Society of Natural History recorded data suggesting around half the nation’s pet dogs were emotionally affected. For most dogs, this meant they became quite frightened, though some terrified pups went as far as trying to hide from the eclipse. So, during the eclipse, give your dog a little extra love and take measures to ensure they don’t try to run away. If you head outside, keep your dog on a leash. Unlike dogs, cats are known to keep their cool during eclipses. Research from the 1970s found most cats simply took the opportunity to have a nap, while a few meowed in confusion. Generally though, you can expect your cat to be just fine. Just as you do during firework holidays, make sure your pet is either safe inside for the eclipse or on a leash and under careful watch. 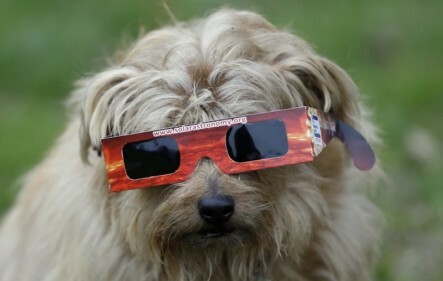 “Safe solar viewing is always a must, no matter who it is,” Reynolds said, showing a photo of a dog wearing protective glasses. “On a normal day, your pets don’t try to look at the sun, and therefore don’t damage their eyes. And on this day, they’re not going to do it, either,” Angela Speck, director of astronomy and a professor of astrophysics at the University of Missouri, said at a news conference with NASA on June 21 in Washington, D.C.
Sources: Can Your Pet Go Blind from the Solar Eclipse?